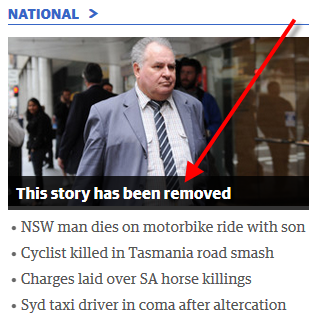 In the one above, there really was a link to a page titled ‘This story has been removed’ which mentioned some doctor up on a sexual assault charge. The story was there, but the headline was odd. I suspect there was some threat of legal action and the story should have been deleted, but instead it remained and the headline and thus the summary headline/link reflected the changed title. Oops.